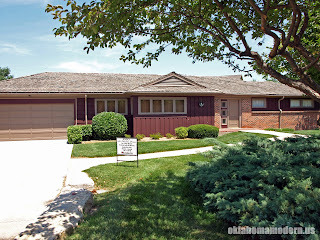 In 1953 the Kansas City Power & Light utility company decided to build a model home to showcase the virtues of total electric living. The home was designed in the new "ranch style" and featured all the latest conveniences. They decided on a location in a suburb called Prairie Village, Kansas. The home was completed in 1954 and within six months more than 60,000 visitors had toured the model home. Standing outside today you might wonder what all the fuss was about. The exterior is a typical ranch with wood shingles and a two-car garage. But step inside and you'll be transported to a world of Fifties high-tech. Automatic night lights illuminate the living room and hallway. The large picture window is shaded by motorized curtains. A panel beside the sofa provides remote control of the television- which is hidden by a painting! The laundry room is outfitted with a combination washer/dryer (an appliance now popular for space-conscious apartments). Step into the garage and you'll notice a massive electric motor hanging from the ceiling to operate the garage door. The All Electric House was built at a staggering cost of $53,000, at a time when most homes cost a fraction of that amount. For the next 40 years it was just another family home in the suburbs. In 1994 the owners had decided to raze the house and build a larger home on the same property. The story goes that some newspaper clippings were discovered in the garage only days before the bulldozers arrived. 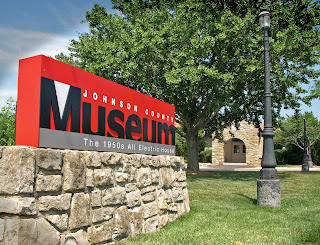 The clippings detailed the unique history of the model home and prompted the family to donate the house to the Johnson County Historical Museum. The house was eventually moved to its present location and restored to its former "Total Electric Living" glory. Which is remarkable when you think about it. Most people would look at this structure and shrug. After all, there are acres and acres of similar abodes in similar sub-divisions in similar suburbs all across America. It doesn't even have a flat roof or an interior courtyard. But that's precisely why it's so remarkable. The fact is someone did have the vision to take this outwardly unremarkable house, split it in two, move it across town, replace all the period furnishings and lovingly restore all the techie gadgets to working condition. And we should all be glad they did. For a virtual tour of the interior visit the All Electric House Home Tour. For an actual tour go to the Johnson County Historical Museum at 6305 Lackman Road in Shawnee, Kansas. For more information visit www.jocomuseum.org. The electric house is definitely awesome. There are a lot of people who visit that place because of its great features. That's a nice idea. Does anybody know how much it would cost to build a more updated version in this day and age.